Forum on Africa in Tanzania. South Africa is gearing up to send another high-powered delegation to the World Economic Forum’s (WEF) annual meeting in Davos, Switzerland – 20 years after Nelson Mandela, still fighting to pave the way for the country’s first democratic elections, attended the exclusive gathering. The by-invitation-only annual meeting in the Alpine ski town of Davos brings together a unique mix of leading businesspeople, politicians, civil society representatives, experts and intellectuals in various fields to debate the most pressing global challenges of the day. The discussions in Davos weren’t always so wide-ranging – or so well-attended – starting off in the early 1970s as business-focused gatherings of European executives. According to Time magazine, conflict resolution became part of the Davos agenda after the formal branding of the WEF in 1987. This was two years after Mandela’s release from prison. 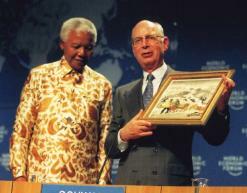 Mandela and De Klerk were both in Europe at the time to accept the Unesco Houphouet-Boigny Peace Prize, which was bestowed on them in Paris on 3 February 1992. The following year, the two men would accept another prestigious joint award: the Nobel Peace Prize. And the year after that, South Africa would hold its first democratic elections. Today, two decades after Mandela’s first Davos appearance, the annual gathering has grown enormously in international stature – and so has South Africa. Jacob Zuma now presides over a country that is punching well above its weight in international affairs, while economically it is increasingly recognised as the springboard into the world’s last great investment frontier. It was this combination of factors that led to the country’s joining the BRICS (Brazil, Russia, India, China and South Africa) grouping of powerful emerging economies in April 2011. And just as South Africa put great emphasis on the 2010 Fifa World Cup belonging to the Africa as a whole, so the country made it clear that it was bringing the continent with it when it joined BRICS. President Zuma has made Africa a central focus of South Africa’s foreign policy. The country is pushing hard for the establishment of a free trade area covering 27 countries in east and southern Africa. This would create a market with close to 600-million people and a combined gross domestic product of US$1-trillion (R8-trillion). Recently, South Africa assumed the rotating presidency of the UN Security Council for the month of January 2012, and Zuma led an initiative that saw the Council unanimously adopt a resolution to enhance ties between the UN and regional organisations, particularly the African Union. And in late January, South African minister of home affairs Nkosazana Dlamini-Zuma announced her candidacy for the chair of the African Union Commission, a move which the Zuma administration sees as crucial to strengthening the continental institution in order to promote African conflict resolution and regional integration. 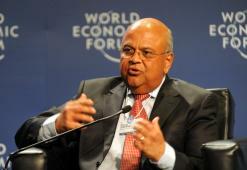 When Davos 2012 kicks off on 25 January, the South African delegation in attendance will be smaller than the one that arrived in Switzerland in a blaze of colour during the country’s Fifa World Cup year in 2010 – but no less influential. And, as in 1992 when Nelson Mandela and FW de Klerk took their places on the podium, people will be listening when the South Africans join the conversation.